The goal of the 73,000 sq. ft. Doris and Bob Holloway Health & Wellness Center (HWC) at Lindsey Wilson College is to promote social interaction, friendly competition, and a sense of team or personal accomplishment for participants of all skill levels and abilities. Components include cardiovascular equipment, indoor walking track, rock-climbing wall, three basketball courts, racquetball court, weight lifting room, dedicated space for wrestling, recreational areas, and a natatorium. The natatorium offers a 6,500 sq. ft. pool area that includes an eight lane 25-yard swimming pool with eight starting blocks for competitive needs. 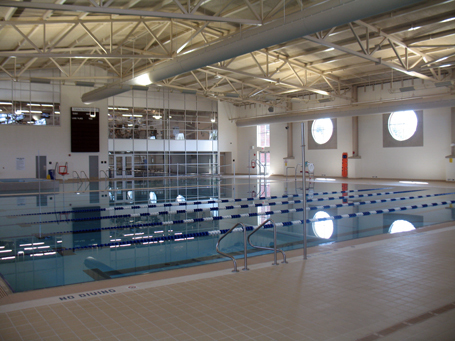 The attached recreation pool accommodates social fun with water volleyball, water basketball, and an aqua climbing wall. For a calming retreat, a 400 sq. ft. 40 person spa is a soothing sanctuary for those students needed a much deserved get-a-way.